David Duong’s family had to be rescued at sea after fleeing Vietnam in a small boat at the end of the war. 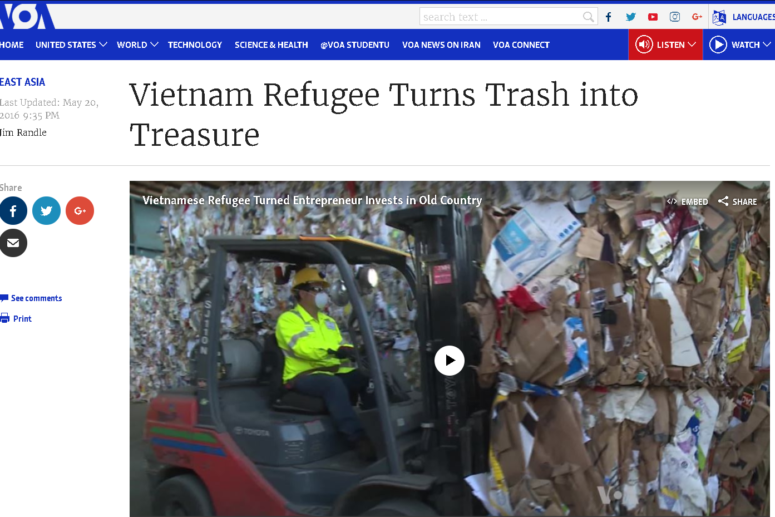 After time in a refugee camp, they arrived in the United States in 1979 with no possessions other than the vision to find opportunity where other people could see only trash. 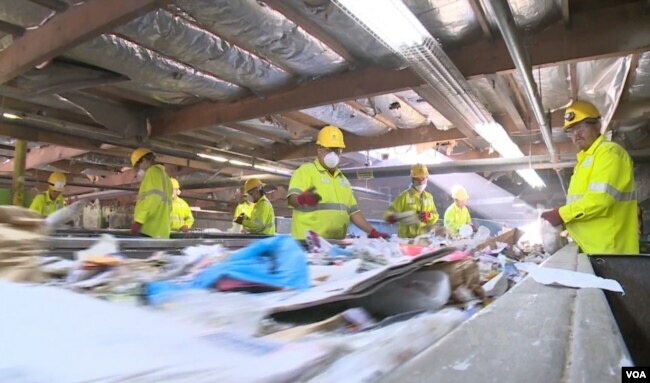 Now, the family recycling business in California is worth hundreds of millions of dollars, employs hundreds of people, and is investing back in Vietnam. 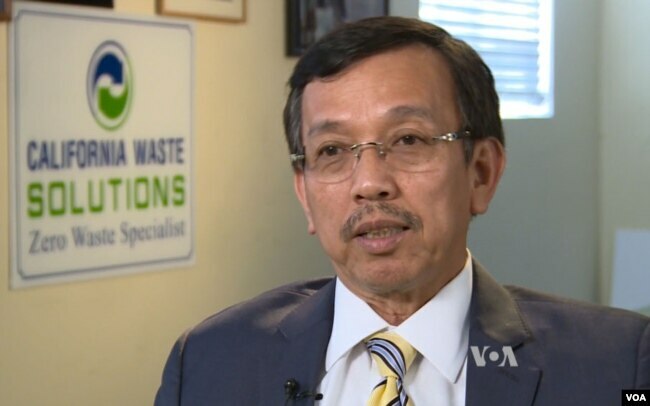 Duong’s company, California Waste Solutions, operates in Oakland and San Jose, California. It has fleets of specialized trucks that cost about $300,000 each that go out at dawn to collect recyclable materials. Thousands of tons of material are brought to the company’s large, complex, highly automated sorting plants. David Duong, president of California Waste Solutions. 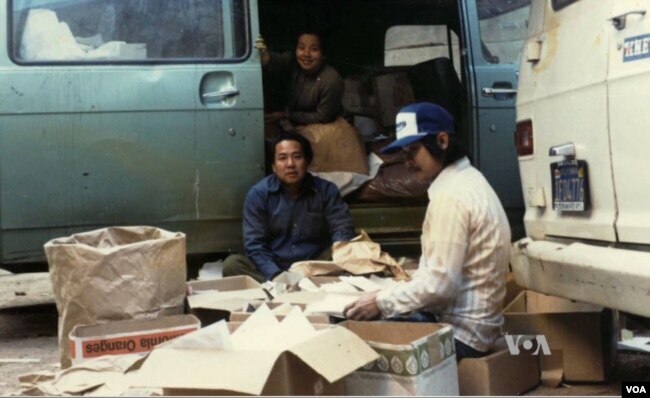 It is a huge evolution for a company that began when Duong’s new immigrant family desperately needed work and money and started picking up cardboard on the streets of nearby San Francisco. They sorted recyclables out of trash by hand and sold them to be turned into boxes, cans and other products. The 23 members of the Duong family were among the thousands of people who fled chaos as the Vietnam war ended. “We almost died in the ocean because the engine broke, and we have to be out there the boat just floating,” Duong says. Duong’s father scraped together a $700 down payment on a used truck. But as a new arrival with no credit history, he had trouble borrowing the rest of the money for the truck. Many machines now do the sorting that Duong’s family once did by hand. Some machines use magnets or electric charges to sift iron or aluminum to separate valuable metals from other materials. Other machines, some the size of large rooms, use bright lights, puffs of air and computers to separate lightweight material like plastic bags from heavier fiber materials. The noisy process involves numerous lengthy conveyor belts and many large, expensive, and complex pieces of equipment. The point of the process is to sort a tangled jumble of stuff into relatively pure piles of aluminum, paper or certain kinds of plastic to be used as an economical raw material for manufacturers. At Duong’s recycling facility, employees and complex machines now do the sorting his family once did by hand. It is also good for the environment, said Chief Operating Officer Joel Corona, who says the goal is to send “zero waste” to California’s landfills. Back in Vietnam, growing concern for environmental issues presented an opportunity for California Waste Solutions to expand. The company has been operating modern facilities, built and operated to U.S. standards, for some time. Duong says Vietnam’s government is making it easier to invest there, which could encourage some overseas Vietnamese to overcome lingering anger and start new ventures in the old country. “We can take the technology that we learned, we do it here in the U.S., bring it back to our hometown and be able to help the people of Vietnam and help the environment, and those are things I’m just so proud,” he says. So Duong is exporting more than just 500 kilogram bales of cardboard, plastic, or aluminum. He is also sharing the idea that a combination of hard work, risk-taking, good luck and bold vision sometimes really pays off.